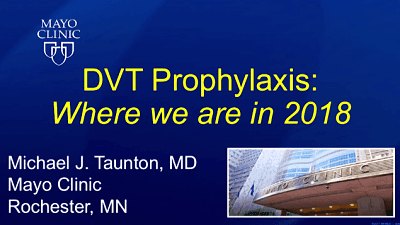 A patient-specific approach to preventing deep vein thrombosis should balance safety and efficacy, taking into account patient and surgical factors, says Dr. Michael Taunton in an article originally published on August 2, 2108. Comparative Effectiveness of Pulmonary Embolism Prevention After Hip and Knee Replacement (PEPPER). ClinicalTrials.gov identifier NCT02810704. Accessed March 18, 2019.